LLAA is sharing the most recent newsletter from Minnesota Lakes and Rivers Advocates. Minnesota Lakes and Rivers Advocates' mission is protect Minnesota's lake and river heritage for current and future generations by forging powerful links between lakes, lake advocates, and policy makers. I have just received this announcement and wanted to make sure all of you saw it. Governor Dayton has scheduled a Clean Water Summit for February 27th. This event will likely set the Governor's water agenda in coming months and years. Take the Survey to let Governor Dayton know that the fight to stop Aquatic Invasive Species needs his leadership. AIS is a biological pollutant as serious as nitrogen and phosphorus, but unlike those contaminants, it CANNOT BE CLEANED UP. As Lake Association members, and lake home and cabin owners, we know the water problems facing our state. You may never have a better opportunity to bring the issues you care about forward in the public policy arena. Please take the time to fill in the survey. If you can attend the event, there is a registration link. Let Gov. Dayton know Aquatic Invasive Species is a biological pollutant, capable of destroying Minnesota's Lakes and water based tourism economy. TAKE THE WATER SURVEY AND HELP SET AGENDA FOR GOVERNOR'S WATER SUMMIT, which will take place on Saturday, February 27, 2016. Registration is now open for the Governor’s Water Summit, which will take place on Saturday, February 27, 2016. The summit will focus public attention on the serious challenges facing Minnesota’s water supplies – in both rural and urban areas of the state – and continue statewide dialogue around steps that must be taken to address those challenges. The summit will bring together water quality experts, farmers, legislators, regulators, the business community, members of the public, local leaders, and a wide variety of other stakeholders. Registration is now open for the Governor’s Water Summit, which will take place on Saturday, February 27, 2016, at the InterContinental Saint Paul Riverfront. Registration can be found online at this link. This link will also be available from the homepage of the Governor’s website. Registration is open to all Minnesotans, and is free of charge. To ensure that all Minnesotans’ voices are heard on this important, statewide issue, stakeholders and other interested members of the public are encouraged to take this online survey, launched in conjunction with the Governor’s Water Summit, regardless of whether they plan to attend the summit in February. The information and input gathered from this survey will help inform the Administration and Legislature on Minnesota’s water quality challenges and possible solutions. The survey can be found online at tiny.cc/MNWaterSurvey. 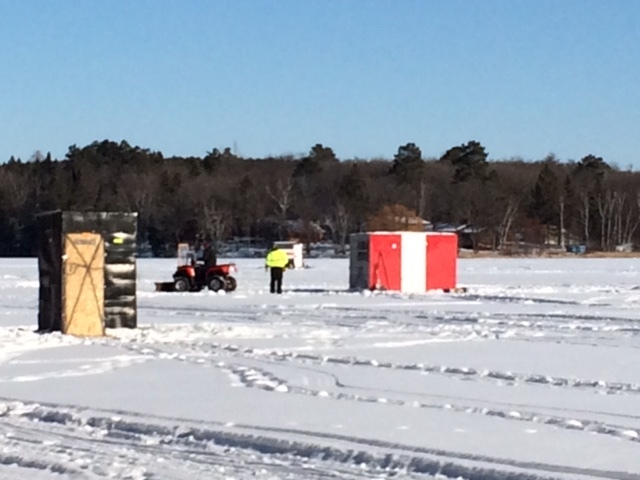 Our team of ice spotters who can view the deepest part of the lake from different vantage points have concurred that Long Lake has now frozen over. Our official "ice-in" date is Wednesday, 12/30/2015. The ice houses at the south access are now increasing the population of Hubbard! Don't forget the kids fishing contest that is ongoing here on Long Lake http://www.longlakeliving.org/p/kids-fishing-contest.html. Enjoy our New Year and the Winter of 2016 here on Long Lake! 2015 was a significant year for our northern Minnesota lakes region. Legal issues regarding the Sandpiper oil pipeline were taken all the way to the Minnesota Supreme Court and on December 15th the court refused to hear the Enbridge and Public Utilities Commission petitions. This means that the prior decision of the Minnesota Court of Appeals stands and that a full environmental impact statement needs to be prepared ahead of a PUC Certificate of Need decision. The nearly $14,000 contributed by 82 Long Lake families helped pay for the legal costs incurred by Friends of the Headwaters in presenting to the Appeals Court. 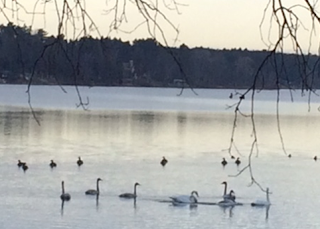 We continue to enjoy the lake, as do the swans and other migrating waterfowl. To Every Heart--Gratitude, Joy, Light, and Peace from the Long Lake Area Association!